A high stakes game in the North’s unfinished peace process played out before the world’s media last week. But almost twenty years after the Provisional IRA’s ceasefire, the shock detention of Gerry Adams on allegations of past IRA activity ended in a dramatic triumph for the Sinn Fein leader. If the arrest and detention was a power play by PSNI and British hardliners attempting to reassert their control in the Six Counties, it backfired spectacularly. After a hopelessly meandering four-day interrogation, Adams successfully faced down the outpouring of years of sniping accusations which have always dogged his leadership of Sinn Fein. The allegations were based largely on the Boston Project, in which the grievances of former republicans angered by a perceived sellout of their movement by the Sinn Fein leadership was gathered, ostensibly as an oral history, by Boston College. In 2010, the publication of some of those grievances encouraged malign British ‘securocrats’ to build a case against Mr Adams and other senior republicans. But at a critical juncture, Adams ingeniously transformed an attempt to damage him politically into an event which has launched a potentially historic election campaign for his party. Although there remains a possibility that charges will follow at a later stage, the decision to release him almost certainly means that there is now insufficient evidence to offer a prospect of prosecution. Sinn Fein representatives said the Adams arrest had galvanised support for the party. His release from Antrim interrogation centre was triumphal. Election rallies in Belfast and Dublin were even more euphoric, and party activists expressed confidence that the arrest of Mr Adams “had put a rocket under the Sinn Fein European and local election campaign” on both sides of the Border. 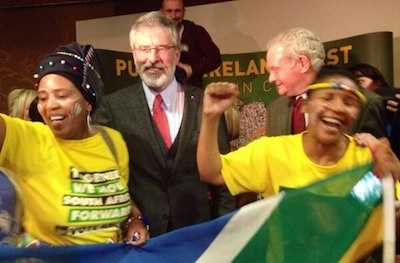 Mr Adams concentrated on energising Sinn Fein supporters for the election campaigns. He said that “the sham” he had been was put through at Antrim station sent the wrong signals about policing to the public. He said that Sinn Fein would not be diverted from the job of “building the peace”. While strongly criticising the food he received at Antrim interrogation centre, he later referred to the anniversary of the death of hunger striker Bobby Sands on Monday and said that his “four days (in custody) is no big deal in the scheme of things”. And speaking in Dublin, Mr Adams called on the 26 County government to stop Britain from persecuting republicans. He told party members that there had been a serious attempt to charge him and he rejected the idea that his arrest and interrogation for some 33 hours was a stunt, as some commentators suggested. “If there was a charge against me, I would have been charged,” he said. Adams also shared his feelings about the 1972 disappearance and death of alleged informer Jean McConville. “What happened to Jean McConville and her ten children was dreadful and unjust, especially because it was Republicans who said, ‘It was in the middle of the war’ and so on and so forth. But we cannot rail against injustice by British forces until we face up to these matters ourselves. “While the past is hugely important, it’s all about the future. It has to be about the future. The past cannot be allowed to chain people, to prevent people from building a decent future,” he said to approval from the crowd. He joked about the “trouble” he had leaving the barracks where he had been detained by the PSNI due to a loyalist protest. “I said to them: ‘If they [the loyalists] were Republicans, you would have moved them’,” he said. Speaking later to journalists, Mr Adams said “two standards” were operating in the north of Ireland in terms of dealing with the past. He said the allegations made by Boston project interviewees had formed the mainstay of his arrest and that the majority of those interviewed were “anti-Sinn Fein”. “The Boston College Belfast project was flawed from the beginning,” he said. He said everyone had the right to record their history “but not at the expense of the lives of others”. Two of Sinn Fein’s long-standing critics, former IRA political prisoner turned researcher Anthony McIntyre, and New York-based journalist Ed Moloney, operated the project. Among those who agreed to be interviewed were former IRA commander Brendan ‘The Dark’ Hughes and another senior IRA figure, Dolours Price, who have both since died. The project resulted in hundreds of transcripts from interviews with 26 participants, and at least one videotaped interview, with veteran Dolours Price, which was carried out in 2010. Mr Adams pointed that the Boston project was initially conceived by a former aide to unionist leader David Trimble. “This flawed project was exposed when Ed Moloney chose to capitalise on the death of Brendan Hughes and write a book,” he said. “No republicans, including myself, who were slandered in that book were offered the opportunity before publication to rebut the allegations made against them. Ed Moloney needs to explain that decision. In response, Ed Moloney denied the interviewees were biased against Sinn Fein. He said people were still unaware of who most of them are, and Adams was speaking “from a position of almost complete ignorance”. He also said he was “glad” Boston College was now willing to return the tapes to interviewees. “We have been pressing Boston College for over two years and the college was refusing to do so on the grounds that they were holding them for the PSNI, so I am glad that they are returning the tapes,” he said. However, he said Boston College may have difficulty identifying some of the anonymised interviewees because identification forms had been “lost”.